One day a lady… next day a baby! Lots of airedales… part 2! Mum got pictures from an airedalefan. I already told that yesterday or so. Mum said she was going to do something with them, put them in something. Well, I did not understand! Other people came to see me too and did praise me! Even a little human girl of two years old came very close and touched me. I didn’t move! I just smiled as a lady should! Her human mum said she was really impressed by me! A few weeks ago, my mum got a present! A present of an airedalelover! And when I say an airedalelover, I really mean it! You know: this airedalefan is the human mum of my doggie-mum Funnygirl! 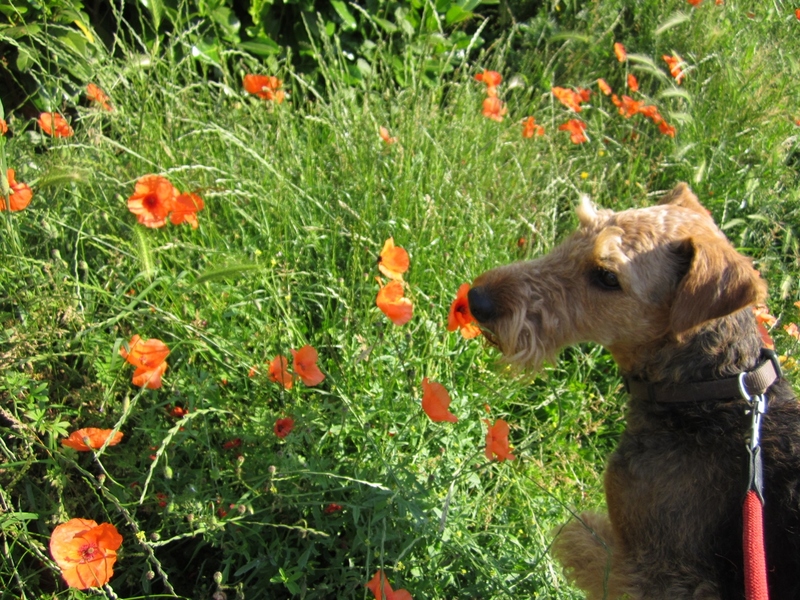 The human mum and dad of my doggie-mum have airedales for more than 30 years! Lots of airedale-babies are born there! I am one of them, so is my sister Féline. And we are very proud about that! Mum is going to do something with them, put them in something… Anyway, she’s going to put them at the wall on the first floor, she says. Aha, I maybe can play with all these friends??? I can jump against the wall too! Don’t you dare, Kita! No jumping at all, against the wall!!! Anyway, more pictures when it’s ready, mum says. Ik ben er niet bij… wat jammer! Vanmorgen in de hondenwei! Wel 16 honden! Dat is veel, heel veel, zeker met zo’n weer. Het was al 22°C, maar toch nog fijn. Straks wordt het weer 32°C. ’s Ochtends is er heel veel schaduw in de wei, dat vinden wij leuk. My grandpa Lennox and I, we like that place, oh yes! 🙂 My mum and dad too! 🙂 Can you see on the pictures where we were? Now we are home and I can show the pictures my mum made! Hey you, little cute one… Welcome Seppe! Mum, mum… come and have a look! There’s a new pup in town! You know I’m crazy about pups, I like to play with them. This one is a real cutie! All black, with big ears! A shepherd boy! Hello! I am Kita. What’s your name, little one? Seppe? That’s nice! You hear what my mum says? A very good name for you, she thinks! We go for a walk? I look after you! Gitte is here too, you see? Mum?… She did it again! In the dogpark, there were two little baskets, green ones. The humans put the empty bottles in it and one woman fills them with water for us. That’s nice, no? This evening we went to the dogpark and mum had lots of things with her! And she did it again!!! She really did it again! She once again is smarter than this airedale-lady! The pictures show why! Maybe I should ask some advice at some overseas friends… Tarquin and Tyee, maybe? This was the situation this morning! Life can be a little difficult! Really! My name is Kita, but very often my mum calls me Poppie. In Dutch that means: little doll!!! Don’t you think that’s confusing? My dad, he calls me Bobbie! More confusing names… Anyway, I know it now: Kita = Poppie = Bobbie! Few days ago, we walk to the dog park. Suddenly my mum says: look, Kita, there are poppies! Me? I look around to see other Kitas. No dogs, no Kitas!! 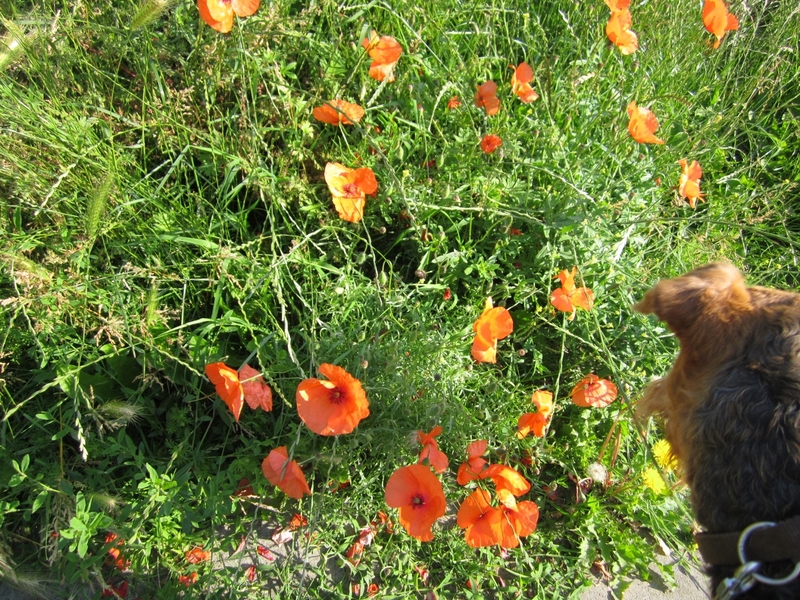 I bark to get my mums attention who says again: poppies, look, Poppie, poppies! My goodness! Something is wrong with my mum, really wrong. 😦 I bark again: wafwaf! Look here! Only one Kita, mum! Only one Poppie! No Poppie, look here: the flowers! Those are poppies! Mum says there’s a very sad, old and well known poem about poppies… written in World War I… Mum, will you put the poem with the story? Wat is dat?… Orthopedisch bed? Wat komt er uit de grote doos? Wat is dat nu? Het lijkt wel een salonzetel. Maar dat is toch te klein voor het vrouwtje, en te laag, hihihi. Ik snap het niet. En nu roept ze niet mij maar mijn opa Lennox! Wel, wel! Opa Lennox moet in het bed gaan liggen en hij lijkt het nog leuk te vinden ook. Hij blijft mooi liggen voor de plikplokplaatjes met het blinkend doosje. Wat zegt ze allemaal, het vrouwtje? Een otopobed? Neen, Kita, een orthopedisch bed! Oké, een hondenbed dus! Wat zegt ze nog allemaal? Speciaal voor senioren, honden met heupdysplasie en gewrichtsproblemen? Ik snap er geen lap van. Even blaffen: ik wil in dat bed! Ik mag eens proberen van opa Lennox en ik blijf mooi liggen! Voilà: het bed is ook voor pubers zonder dysdingen en zonder problemen. Grandpa Lennox in his new special bed! Hai mum, give you my special smile, because you bought me a bed too! Just trying the bed of Grandpa Lennox!